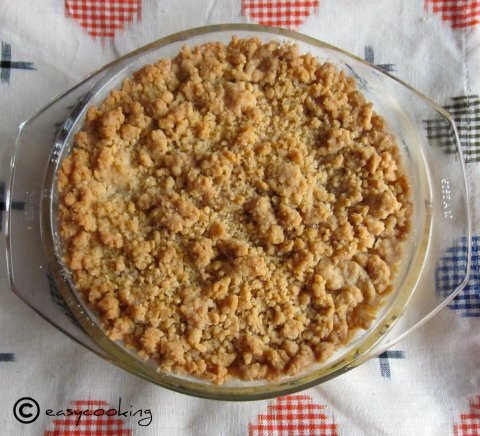 Easycooking: Apple Crumble with Custard Sauce & a Giveaway!! Apple Crumble with Custard Sauce & a Giveaway!! Apple and Cinnamon are a match made in heaven,isn't it? The smell of cooked Apple with a hint of Cinnamon is really to-die-for.The only time I disagreed with this was when I had Apple-Pie.I had read so much about Apple-Pie and the lattice design on top seemed to sing to me whenever I passed by it.I had no clue as to how it would taste[this was some 6-7 years back].We were in Spenser Plaza,tired and hungry after all the shopping and I though it was the right time to try this one out. We bought a slice of Apple-Pie and a huge glass of Cold Coffee and dreamed us going into heaven once we had a bite of it.But wham..it was [in one word] yuck!The crust was soggy and the apple smelled funny,we swore never to touch "that pie" ever again. Well,this post is not about Apple-Pie,but something more delicious and something which is easier to whip up.This one was also new to me,I had never had it before and the combination with Custard sauce pulled me to it.The aroma coming out of the oven when it was baking assured me of its taste.It was gone in no time as we had some friends over for lunch.They were a bit sad faced when I told them there was no cake this time,but seeing the expression on their faces after they had a spoon of it assured me that "aaal eez well"!!! Wash peel and chop the apples. Add a few drops of lemon juice to prevent browning. Mix in 2 tbsp sugar,grated cinnamon and cook on a low fire until soft and mushy. Set aside to cool. Mix salt and 2 tbsp sugar with the flour. Lightly mix in the butter without kneading until you get a mixture that resembles bread crumbs. Grease a pie dish/cake tray with butter. Lay the cooked apples evenly. Add the flour mixture evenly on top and press down gently. Sprinkle sugar on top. Bake in a pre-heated oven at 180C for 25-30 mins. 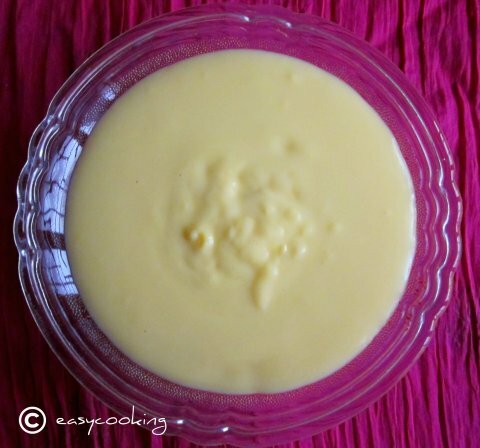 Blend vanilla flavoured custard powder with 1.5 cups of milk and 4 tbsp sugar (adjust to taste). Cook on a low fire until pouring consistency. Cool, chill and serve with warm apple crumble. Verdict - As Nags says,the combination of Apple Crumble with Custard sauce will make you crave for it.The only thing I found amiss was,the recipe calls for using butter at room temperature whereas I felt butter straight out of the fridge would make better,even bread crumbs like texture when mixed with the flour.And also,I thought that the butter was a bit much,75gms for 1 cup of flour would have been ideal.Not that it affected the taste in anyway,hell I don't even have leftovers so that I could warm it up and eat!!! Sending this to Ruchika who is hosting an event on her blog called Baking from a Book,an event originally started by Champa. Oh wow!! This does sound heavenly indeed! I have eaten a terrible apple pie once(highly recommended in that restaurant! ), never made it at home though...Do the regular apples work fine for bakes?? Haven't come across cooking apples here..
Couldn't agree more with you 'Apple and Cinnamon are a match made in heaven'. Even I feel butter straight out of the fridge would make better crumble n pie. Apple crumble is an absolute fav with Krishna's Favorite Neha Didi and Have finally figured out Akshita's sort of Apple Crumble. Love the apple-cinnamon-custard combi!! !a must try..Glad im following u!! Oooj! I love crumbles! I actually love the crumble part more than the fruit!It is so buttery! 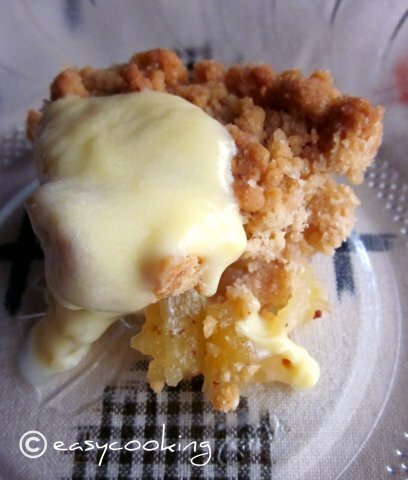 it looks yummy and new to me..
Wat a tempting dessert, absolutely delicious..
Apple crumble with custard sauce looks very delicious and tempting.Nice pics. Love the wonderful giveaway too. Looks tempting Divya, I have never made one at home though. Just a thought, since you said it was inspired by Nags and a cookbook- Im hosting an event called baking from a book, would you want to send this as an entry? 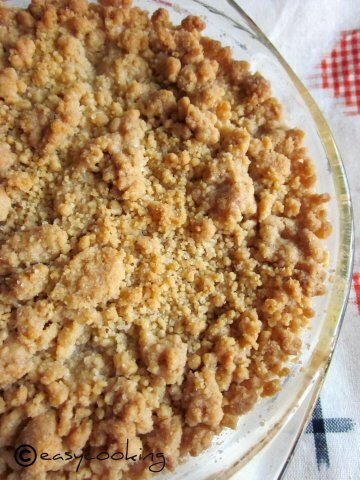 Apple Crumble is actually one of the first desserts I'd ever eaten. Yours looks fantastic! Chocolate Cake for a Birthday Girl !! Semiya Payasam ~ Happy Onam!! Hot Milk Sponge Cake..for Friendship Day!! !